Despite having some painful medical tests today (fresh baselines for the new neurologist), I am where I should be: 15000 on the nose. I won’t be putting up anything about my story today; I’ll say something tomorrow for sure, though. I’ll just leave you with a picture of my new friend, Darla, and my rocket duck, Percy. Darla’s expression will probably make her a good guilt dragon for the rest of NaNo. 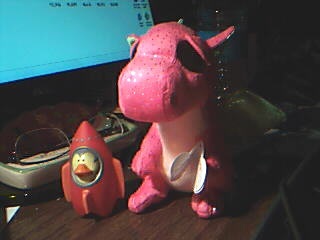 Darla the dragon and Percy the rocket duck. My current muses. 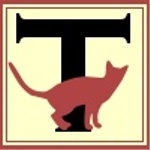 Posted on 10 Nov 2016 by TikatuPosted in Announcement, NaNoWriMo, original fiction, WritingTagged amwriting, nanowrimo, original work, story: Rebels of the Hex, word count, writing. Previous Previous post: Fire drakes! Next Next post: My fingers are sore!